A wedding band that is the perfect blend of exquisite craftsmanship, style, and design. Art meets engineering as 0.49 Carat t.w. 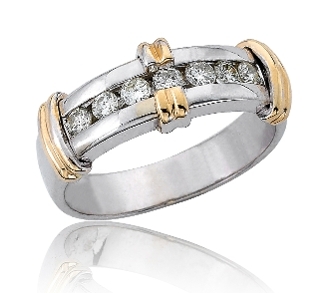 channel set brilliant round cut Diamonds sparkle gracefully in the fine 14 Karat white gold accented with 14 Karat yellow gold bar station roping. The ideal choice when choosing a ring that is both elegant and refined. Perfect for a wedding band or anniversary gift. For added appeal personalize your item, select our Engrave option and indicate size needed when adding to Cart.